I posted an earlier video showing falling water visualized using a strobe light. Here's another video showing three whiffle golf balls connected with rubber bands and the three modes of vibration, again captured using a strobe light. And finally, a very entertaining video showing a structure created in finite element analysis software ANSYS, with the modes of vibration animated. What's great about this example is that most 3D parametric modelers (Inventor, Pro/Engineer, SolidWorks, etc) have either built in capability to do similar analysis or can do so through an add-in. This would be a great way to get students involved in promoting your program - have students create their own little videos showing various structures and their modes of vibration. Competition in the classroom is always a great motivator. Great way to engage students and get them interested in careers in STEM. The new USB 3.0 spec, which can handle data transfers of up to 4.8 Gbps, is the successor to USB 2.0 and should be appearing in devices in late 2009, according to ZDnet. The USB 3.0, which is also dubbed "SuperSpeed", is up to 10 times faster than USB 2.0 is predicted to be more power-efficient. USB 3.0 will remain backwards compatible with USB 2.0 as far as the Type A connector is concerned. While USB 2.0 is based on uni-directional data flow with negotiated directional bus transitions, USB 3.0 supports simultaneous bi-directional data flows through the use of dual-simplex four-wire differential signal wiring as compared to half-duplex two wire differential wiring in USB 2.0. The internet makes copying cheap. Businesses that see their livelihood as dependent on the restriction of copying – concentrated in the recording, film, publishing and software industries – are understandably upset. Their goal is to have the same ability to control their content as they had in an analog world but to keep all the benefits of pervasiveness, cost saving, and viral marketing that a global digital network brings. To that end, they have moved aggressively to change laws worldwide, to introduce stiffer penalties, expand rights, mandate technological locks, forbid reverse engineering, and increase enforcement. It is not so much a case of wanting to have their cake and eat it, as to have their cake and make your cake illegal. Yet there are hints in each of these industries of a different business model, one that aims to encourage, rather than to forbid copying. At the moment, the hints are only that – a scattering of anecdotes suggesting alternative ways of supporting creativity. It is not clear if they will thrive or even survive, still less whether they can “scale” to a broader audience. Still, if the alternative plan is to make the internet illegal or sue grandmothers for downloading, it might be worth taking a look at them. In my next few columns, that is what I will do – study “copy-friendly” businesses, beginning today with publishing. Why might free digital availability make sense for parts of the publishing industry? First, most people hate reading a book on a screen, but like finding out if it is worth buying. I am sure I have lost some sales, but my guess is that I have gained more new readers who otherwise would be unaware of my work, and who treat the digital version as a “sampler,” to which they then introduce others. This is a leap of faith but not an unreasonable one. Second, even professional authors make money in multiple ways other than by royalties - ranging from options on film production to commissions for magazine articles to consulting, teaching and speaker fees. Most are aided by wider exposure. As Doctorow says, “my biggest fear as an author isn’t illicit copying, it is obscurity.” Third, digital distribution is almost free. The “cost” is the gamble over lost sales, not remaindered books with their covers torn off. Some publishers are willing to take the risk to build current and future demand. Who is least likely to try free digital distribution? The blockbuster author. Do not expect to see Harry Potter released this way. JK Rowling does not have to struggle against obscurity, and, given market saturation, it is unlikely that her publisher would see the method working for her. But the next Rowling? That is another story. And perhaps a free one. If you like it, please consider buying a copy. researchers at Northwestern University set up a new system that borrows a page from brick-and-mortar neighborhood-watch programs to keep an eye out for network problems. The researchers have asked users across the Internet to download a piece of software that looks for performance abnormalities on local networks and reports them back to a central repository. That allows an Internet-service company to look in on the system — called the Network Early Warning System, or NEWS — and detect any unusual concentrations of network-traffic problems that might indicate an area of the network that needs repair. The system uses BitTorrent, a popular method for peer-to-peer file trading that many students use to trade music and movie files. The software tool is free, but requires users to first download a BitTorrent client called Vuze. Read about other projects at AquaLab here. although schools generally had the same equipement, it was the lack of trained personnel which created a participation gap between students. While private schools had well-staffed technology centers with trained professionals, the public schools had their computers locked in rooms, whcih neither students nor professors could access, because they did not know how to use them. Given our findings, I strongly believe that workshops must be implemented to train educators not only on how to use technology, but how to teach it to their students. Just a brief update to try to explain what some commenters dont seem to understand. 1. the only thing that cable companies, and satellite for that matter have to sell is bandwidth and the applications they can run on that bandwith. More bandwidth means more digital everything. 2. For Basic Cable subscribers that get say, 40 analog channels, they are consuming 40 x 38.6mbs or 1.54 Gbs. Let that sink in. 1.54 Gbs of bandwidth. Compare that to how fast your internet access is. That more bandwidth than your entire neighborhood consumes online , by a lot. Thats also the equivalent of 500 standard def digital channels. If you convert that to revenue per bit for cable companies, or cost per bit for basic cable consumers, the basic cable customers are getting the best deal in town. By a long shot. Eighty-five percent of companies are already using open-source software, with most of the remaining 15 percent expecting to do so within the next year, according to analysts at Gartner. However, only 31 percent of companies surveyed by the analyst house had formal policies for evaluating and procuring open-source software (OSS). Gartner conducted its survey of 274 end-user organizations across the Asia/Pacific, Europe and North American markets in May and June, and announced the results on Monday. The 3M, if you recall, had a VGA input along with a composite A/V input, but of course no SD reader. The Aiptek doesn't have the VGA input, but it's a tradeoff I can live with. In two weeks I've gone from not believing much in the pico movement to being a fervent supporter. And if you're going to be an early adopter, I am happy to say that, because of the Aiptek PocketCinema V10's better geek features and much improved build quality over the 3M MPro110—and $50 cheaper price to boot—I found a pico projector that I can genuinely recommend. The only hold back is that they're just gonna get better and better. In an earlier blog post on the iPhone and the iPhone SDK, I advocated for optimizing your college or university website for mobile devices. Students at the Massachusetts Institute of Technology who want to use their iPhones to look at course syllabi or check the campus-shuttle schedule can now surf to a version of the MIT Web site designed especially for cellphones. And officials plan to let other colleges use the Mobile Web project software. The goal of the project is to create MIT Web pages that load quickly and look good on all kinds of Web-capable cellphones, often referred to as smartphones. Most college Web sites are designed for big monitors and fast Internet connections, but those pages are often hard to navigate on smartphones. So MIT officials are now encouraging cellphone users to use the new mobile Web site, at m.mit.edu, when visiting the Web site from their phones. A great visual explanation of the financial crisis from online money management site Mint.com. Each analog channel takes up 38mbs of bandwidth. Thats right. CSPAN takes up more bandwidth than you have available to you for internet services. Crazy isnt it ? The demand for iPhone developers exceeds the supply and I don't see that changing anytime soon. The going rate for iPhone developers, at least the developers I know and trust, is $125/hour and up. I have some friends who are booked out at $200/hour for the next few months, although $125/hour seems to be the going rate in my network. At that rate, a full-time contract iPhone developer costs $5,000/week and it may take four to six weeks for an application to be developed. Sometimes it will take less and sometimes it will take more. Add to development the other costs - project management, design, QA, and marketing, to name a few. It's not uncommon to spend $30,000 and up on an iPhone development project. iPhone applications are not cheap. I am someone who is highly motivated by ideas. So, it pains me to say that the value of an iPhone application idea right now is pretty much zero. A great idea isn't worth anything under these conditions. There is no shortage of great iPhone ideas, just a shortage of talent to bring these ideas to market. Many people in my network have stopped doing contract work altogether, focusing instead on self-publishing on the App Store and making a living from software sales. The few examples we've had of App Store millionaires has been an inspiration to many to drop out of the contract market. Do you hear that kids - a shortage of talent to bring these ideas to market! Read earlier iPhone programming related posts. "A compendium of what services and companies are no longer available for our Internet pleasure and use." "Tracking the changing retail landscape in today's economic environment." Aren't the closing of retail shops and the shuttering of Internet startups and services a better indicator of how the economy is doing than what the NASDAQ closed at today? Compton Community College has made substantial progress since it was taken over two years ago by the El Camino Community College District, the Los Angeles Times reported. The takeover came after Compton, plagued by years of financial mismanagement and other problems, lost its accreditation. The college, now a satellite campus of the El Camino district, has been rechristened El Camino College Compton Community Education Center. The district has poured $41-million in bond money into renovations of Compton’s crumbling facilities. The college is improving its curriculum, and three new deans have been hired. Officials said enrollment at the college has grown from 3,400 last year to 4,600 this year, partly as a result of better relationships with the local community, the Times reported. The soonest Compton could apply for accreditation is 2013, officials told the newspaper. Here's a really funny draft of a recommendation letter from John L. Jackson Jr., an associate professor of communication and anthropology at the University of Pennsylvania. Are you bleary-eyed and exhausted from all the applications you’ve received and read thus far? Hey, have you already decided on your choice for the position? Is there an inside candidate I don’t know about, somebody who effectively makes my reference letter a waste of everyone’s time? I usually don’t ask such questions when I start recommendation letters for graduate students, but I’ve decided to cut to the chase this year. I want the skinny. There are so many credible candidates for your advertised post (I know of at least 10 folks, and I’m writing reference letters for three of them); I can’t imagine that the process will be easy. If you didn't follow the recent social media battle between Motrin and Moms, Joe Jaffe gives a great 30-second synopsis, followed by some commentary. The big, long file-sharing case known as London-Sire v. Does 1-4 — for anonymous students at Boston University — isn’t going well for the music industry. The digitization project should help the Israel Antiquities Authority, which oversees the scrolls, improve access to the documents without exposing them to light, heat, and other threats. The researchers discovered this dual-activity when they measured the creativity of 20 piano, percussion, wind and string players. The musicians were asked to invent new functions for common household objects. On average, they came up with 14 more uses than nonmusicians could. In a second experiment musicians dreamed up new uses for everyday items while the prefrontal lobes in their brains got scanned. And musicians had more activity in both sides of their frontal lobes than nonmusicians did. Researchers think these findings fit with musical talent—for example, pianists use each hand simultaneously to play different melodies and rhythms. And they read notes, a left-hemisphere task, and immediately turn them into music, a right-hemisphere job. When it comes to creativity, harmonious hemispheres make beautiful music together. Q: How have analytics and data mining shaped the services offered by eCollege? A: That's a very critical piece of our strategy, and we think it is important for supporting online students and faculty. The holy grail of online education is to be able to provide personalized instruction for every student. Every action is captured in the data. We can learn how students learn and what makes them successful. So you might learn, for example, that if one student spends more than 10 hours in the discussion thread, they're more likely to fail out of the class. That's data you can use. "Triggers for intervention" is the jargon in the industry, and eCollege provides the tools to identify these triggers. Q: Have analytics and data mining caused eCollege to develop new products? A: We keep evolving the tools that we currently have. We just built something around Cognos, an IBM company that focuses on business intelligence. Q: Have professors been using analytics and data mining to shape their curricula? A: I certainly hope so. The great promise of working with a lot of data is that you can then evaluate if students using one curriculum or in one teaching environment do better than students do in another curriculum or teaching environment, and you can use that to constantly improve your approach. Can I Get a Rx for a Power Nap? Paul McCartney said Monday negotiations on a long-awaited deal to make the Beatles' catalog available on the online music service iTunes have stalled. "The last word I got back was it's stalled at the whole moment, the whole process," the former Beatle said. "I really hope it will happen because I think it should." McCartney, who was speaking at the launch of his new album, Electric Arguments, added: "It's between EMI and the Beatles, I think." The images that surfaced of the new Kindle in October are real - it’s a longer device but not as thick as the original Kindle, and fixes some of the button issues that plague users (like accidental page turns). A larger-screen student version is still scheduled for the first half of 2009. I’m not sure I’d sell a sandwich in exchange for Facebook stock. Here are ten tips to help you add a little zing! to your next presentation. They are, of course, far from comprehensive, but they’re a start. Feel free to share your own tips in the comments. 2. One thing at a time, please. 4. Pay attention to design. 6. Think outside the screen. Time for an Afternoon Power Nap! Napsounds is a repository of relaxing audio files designed for power napping. Every day a unique 20 minute track is generated in the electronic, classic, and nature sounds category. You can listen directly from the website, download the track as an MP3, subscribe via RSS, or set iTunes to grab the track as a podcast. I've read Kurzweil's book - The Singularity Is Near: When Humans Transcend Biology , which gets pretty far fetched in the second half, so I'm somewhat skeptical. But I've been to CalIT2, met Larry Smarr and his team and seen what they're doing - pretty cutting-edge stuff. There's a lot of really bright people working on this stuff and when you consider the dramatic changes that have occured in the last 22 years (1986-2008), would you really be surprised in what the next 22 years could bring? Will Electric Professors Dream of Virtual Tenure? Last month at the NASA-Ames Research Center, a group of top scientists and business leaders gathered to plan a new university devoted to the idea that computers will soon become smarter than people. The details of Singularity University, as the new institution will be called, are still being worked out — and so far the organizers are tight-lipped about their plans. But to hold such a discussion at all is a sign of growing acceptance that a new wave of computing technologies may be just ahead — with revolutionary implications for research and teaching. The idea that gave the new university its name is championed by Ray Kurzweil, an inventor, entrepreneur, and futurist who argues that by 2030, a moment — the "singularity" — will be reached when computers will outthink human brains. His argument is that several technologies that now seem grossly undeveloped — including nanotechnology and artificial-intelligence software — are growing at an exponential rate and thus will mature much faster than most linear-minded people realize. Once they do, computers will take leaps forward that most people can hardly imagine today. In The Singularity Is Near: When Humans Transcend Biology (Viking, 2005), Mr. Kurzweil presents a utopian vision in which these supersmart machines quickly help human researchers cure diseases and vastly extend the human life span. But let's say, for argument's sake, that Mr. Kurzweil is right, and that the animated Microsoft Office paper clip will become the next Einstein. Here are some predictions, based on interviews with researchers who believe that the singularity really is near, about how thinking machines would reshape campus life. To understand what's coming, it's important to recognize how computers — and the Internet — have already revolutionized research and sped up developments in many fields, says Larry L. Smarr, a supercomputer expert who directs the California Institute for Telecommunications and Information Technology, a joint venture of the University of California's campuses in Irvine and San Diego. "I can't imagine doing my research without Google — I don't remember how I did it," says Mr. Smarr, who attended the planning meeting for Singularity University. "I'm one or two orders of magnitude more productive today because of the global knowledge system the Internet has enabled." As computers reach new heights, they will further extend that productivity, he argues. Perhaps we'll soon have machines recording everything we say, see, and hear, allowing us to retrieve experiences we now lose to forgetfulness. Superadvanced social-networking systems might regularly link us to like-minded colleagues to solve problems more quickly. Computerized research assistants might even do some of the work that graduate assistants do today. Professors will be able to assign hundreds of these electronic assistants to problems without having to get grant money to pay them. Virtual professors probably won't ask for tenure. And Mr. Goertzel sees them as key to expanding educational opportunities, by greatly reducing the price of a high-quality education. What if the story ends differently, though? Anyone who's seen a Hollywood science-fiction film knows how smart machines could turn on us. In The Terminator, for instance, brilliant but emotionless machines set out to eradicate humans. I've been advocating non-stop for colleges and universities to develop and roll-out iPhone, Google Android and Blackberry apps. Obviously some institutions don't have the wherewithal to develop apps in-house and will have to rely on outside consultants. Personally, I would love to see app development for higher ed become the domain of students working with our programming faculty, but that's not always feasible or timely. Even better, I'd love to see entrepreneurial student teams form their own consulting firms, maybe as an LLC and get in the business of developing apps. This idea occurred to me when I stumbled upon an ad for the iPhoneAuthors Development Team here. I can't vouch for them - I'm sure there are any number of consulting firms out there doing iPhone development and the list is probably growing. If your school has a great programming program and a business department with an entrepreneurial bent, this might be a marriage made in heaven. Wii in the Classroom - I'm Jealous! I am delighted to get our Nintendo Wii installed and setup in our classroom. To get the audio working I used a small jack for the connections and ran it from the Wii into the PC’s Line In and then out again to speakers. We have one for each of the Year 5 and 6 classrooms. Not only will it obviously be lots of fun, I am hoping to make the most of the games to support learning. We have the Sports game and also Big Brain Academy which looks good. Soon I will take a closer look at BBA and see what more it has to offer in terms of classroom use, so look out for that soon. Here is one sketchy idea already: Addition and Subtraction using Wii Golf (part of the Sports game) Use as a maths starter, an engaging way to generate whole class sums or even a small group activity - children take a shot, we subtract from the total yardage for that hole. Written addition of the yards for different shots. Total yards of shots around a short course. The yardage will only ever be into three digits for a single shot - unless I get a go and it will be less! Perfect 2 and 3 digit addition and subtraction for the age group of our class. Next week we will be getting the children creating their Mii avatars and I will try to find a way to export those images for use elsewhere. I wish that back when I was ten my classroom was this much fun. Time for a College CPO? ... colleges capture a slew of highly sensitive information on everyone on campus. And while chief privacy officer has become a recognized title in the corporate world, higher education seems slow to pick up on the trend — a reluctance that could represent either head-in-the-sand thinking or fiscally prudent avoidance of bureaucratic bloat. Does Your College Have a YouTube Channel? This is a really brilliant use of YouTube by CSU. If your college isn't leveraging free resources like this you're probably at a competitive disadvantage. This is also a great opportunity to involve students from a variety of disciplines in building similar videos. Imagine students from art, communications, marketing, computer science - really any discipine - woking in teams to create 30-second marketing videos. Your college could even make it into a student competition, with campus recognition and college store gift certificates for the winning team. Here are the two 30-second videos - Attention High School Seniors!! and Time is Running Out - from CSU. Click here to watch more videos from CSU or subscribe to their YoyTube channel. Application deadlines at many of the California State University’s 23 campuses have traditionally been loose. Students could apply in the fall, spring, and summer without fear of the campuses filling up. But those days are over. If students don’t apply by November 30, they may not get in, Cal State officials warn in two new videos on YouTube. Officials turned to YouTube as they scramble to get the word out to high-school seniors and to community-college students hoping to transfer. Cal State officials posted links to the videos on university Web sites and also asked communities, churches, and students to post the videos on their personal Web pages. Are Your Students Programming for the iPhone and Other Mobile Platforms? Are you a programmer that just got laid off due to the current economic recession? Well, maybe you might want to consider a slight career adjustment, as it seems that iPhone apps developers are really in demand at the moment. oDesk, a firm that specializes in outsourcing freelance programmers to companies that require programming work to be done, reports that demand for iPhone programmers has surged by 500% from March 2008 to September 2008. “There is a huge demand for iPhone developers and people are quickly learning iPhone development,” reported Adeem Basra, founder of one of oDesk’s highly ranked iPhone development companies. “The demand picked up after July ‘08. I believe we are still way under capacity,” Basra said. Now the question becomes - How do we get started? To begin with, get a Mac - the SDK only runs on an Intel-based Mac. Next register and download the SDK - it's free! Finally, sign up for the free iPhone University Developer Program - here's a slide on the program. and the accompanying book Programming in Objective-C. While the iPhone has already established a huge market-share, it would be a mistake to neglect other development platforms, including the Google Android SDK and RIM's Blackberry platform. A hacked server at the University of Florida’s College of Dentistry has exposed data on more than 330,000 current and former patients there. They were informed of the breach last week. No credit card or banking information was divulged, according to the university. The F.B.I. and campus police department are investigating when the hacker gained access to the server and how. Do Your Students Use E-Mail? Many students don’t even want a college e-mail address these days because they already have well-established digital identities before they arrive on campus. That’s the conclusion that officials at Boston College came to in a recent review of their online services. So the college recently decided to stop offering full e-mail accounts to incoming students starting next fall. Tech Therapists Scott Carlson and Warren Arbogast discuss what college libraries mean to campuses, the buildings' changing aesthetics, and how they will be designed for future use. Growth in Online Enrollment - Setting the Bar Too High? All schools are looking to grow their online offerings, but this is the most aggressive initiative I've heard of. To get from 9% of their credits online today, to 25% online by 2015, Minnesota colleges and universities will have to experience a nearly 10 per cent per year growth in their online enrollments - pretty ambitious! In hopes of saving tax dollars and reaching more students, state leaders in Minnesota say they plan to offer a substantially higher percentage of their courses online in the next seven years. Tim Pawlenty, the state’s governor, and David Olson, the chairman of the Board of Trustees for the Minnesota State Colleges and Universities, held a series of press events today announcing their intention to offer 25 percent of college credits online by 2015. Only about 9 percent of course credits delivered during the past academic year were received through online education. This presentation was linked to in the earlier Clay Shirky posting, but in case you missed it, I thought I would highlight it. Here Shirky gives a 42-minute presentation on his book "Here Comes Everybody: The Power of Organizing Without Organizations." 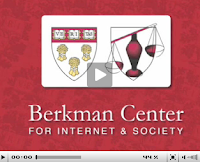 The presentation is hosted by Harvard University's Berkman Center for Internet and Society. The presentation is made available as streaming video, downloadable video for portable devices, high resolution video, and audio only. Really good stuff! Great presentation from Clay Shirky from the recent Web 2.0 Expo. In this talk, Shirky argues that our problem today is not information overload, but instead a failure of our filters. A couple of really great illustrations of the problem using Facebook as an example. If you find yourself overwhelmed by email, news, blogs and rss feeds, give Clay a listen. I'm currently reading Shirky's "Here Comes Everybody" - really interesting ideas, also worth picking up. I just finished watching a NOVA episode on PBS called Hunting the Hidden Dimension. It was a great explanation of fractals, the work of Benoit Mandelbrot, and the many applications of fractals. I studied fractals and their use in finite element analysis in graduate school, so this was lots of fun for me. PBS makes this and other NOVA episodes available online in 7 to 11 minute chunks. The perfect size for instructional content. I plan to use the following clip - which highlights a number of fractal applications, particularly wireless antennas - with my wireless class. Watch the nearly 11-minute clip "On the Defense"
Watch more of the episode at PBS and access teacher resources (classroom activities and multimedia). 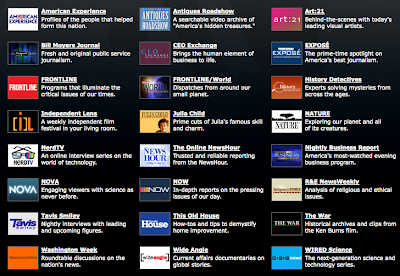 Explore the PBS site - I'm sure you'll find content you can use. After our presentation last Thursday, someone asked about putting audiobooks on the Kindle. 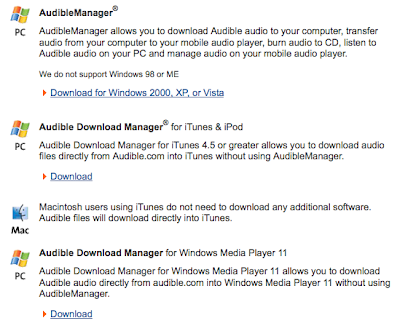 If you're an audible.com user, it appears that their AudibleManager software will allow you to put audiobooks onto your portable device - in this case the Kindle. I've used Documents To Go on Palm handhelds - like the Treo; it's a great application. The ability to edit MSOffice documents on the iPhone would be great addition! You're not going to write a 15-page NSF proposal on the iPhone - although I did on the Treo. Imagine, instead, the ability to recieve a 2-page or even 15-page document while out of the office, review it, make a couple minor changes and send forward. No longer do you have to reply - "I'll look at it when I get to a PC and ge back to you." I call it interstitial tasking - the ability to get work done in those little pockets of time - the interstitial spaces - between our daily activities. For me, it's waiting for a plane, waiting to pick up my daughter at dance, during TV commercials, and even in meetings and presentations. DataViz, makers of Documents To Go, a Microsoft Office editor app for mobile devices, has confirmed that they are developing an application for the iPhone. The application would allow for editing of Microsoft Word, Excel, and PowerPoint files on your iPhone, or, presumably, your iPod Touch. According to a company representative, the application will likely be available in early 2009.